سمنو Samanoo is one of the many items on the haft-seen table or "sofreh" tablecloth that starts with the letter "S." It is a sweet pudding made with germinated wheat sprouts and flour. 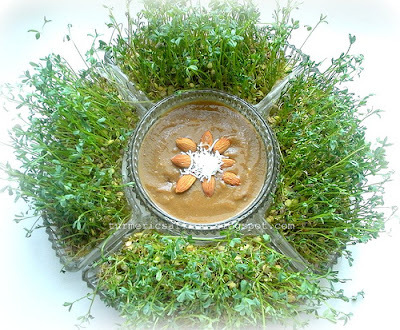 "Sabzeh," wheat sprout, represents rebirth and samanoo represents the reward of patience and sweet life. Making an authentic samanoo requires time, patience and a good arm, or the help of several people to help with the cooking. Usually the person who makes samanoo shares it with others and sends out bowls or containers of it to neighbors, family and friends.The making of samanoo from the start to the finish takes several days. First, the seeds have to be soaked in water for two days, then transferred into a bowl wrapped in a moist cheesecloth and as soon as the new shoots appear they have to be spread out on a paper to completely dry out before grinding and sifting them. "Samanoo pazan," the making of the samanoo, usually takes about a full day. I must say that I don't remember how my mother made samanoo for I was too busy enjoying the holidays, and at the time I wasn't very interested in helping out with making it or even tasting it! And since I moved away from home I would either buy samanoo from a Persian grocery store or there were always some good friends who would send me some for Nowruz. For the last few years, there's been this sweet and generous Iranian lady, a grandmother Zahra khanoum who's been giving me my Nowruz samanoo until this year. Last week, she told me that she was going to Iran for the holidays and that she won't have enough time to make it. Then she asked me whether I would make it on my own if she gives me the dried seeds. After a long pause I said I would. The next time, as she handed me the plastic bag filled with seeds, she gave me the recipe as well. Please see the following link on growing seeds (sabzeh). It takes about 2-3 days for the wheat sprouts to reach 1/2 inch in length, spread them out on a flat surface and let them dry out completely. Grind the seeds as fine as possible using a grain mill and sift through a sieve. Put the finely ground germinated wheat in a cheesecloth and place the cheesecloth in a large bowl. Add 2-3 cup of cool water to the freshly ground wheat and squeeze out the excess water out by pressing down with the back of a large wooden spoon or by using your hands. Add more water if needed. You can use the left-over wheat by grinding it very fine. For each cup of freshly ground wheat, add 2 cups of flour. In a large heavy pot, add the liquid from the bowl with 2 cups of sifted whole wheat flour and mix well, over medium heat. Add more water gradually to cover as needed, bring to a boil while stirring frequently. For the first 30-40 minutes don't leave samanoo unattended. Lower heat to the lowest heat setting and let simmer. I was told for 24 hours! I gave it a total of 3 hours. The first two hours stir and add water gradually when needed and after two hours, when it turns reddish brown, cover the pot and cook for another hour on low heat. Samanoo is sweet by itself and does not need any added sugar. Serve in small containers and share them with others. More power to you for making Samanoo! I don't like the taste of it and the thought of having to spend hours cooking didn't seem like fun either. 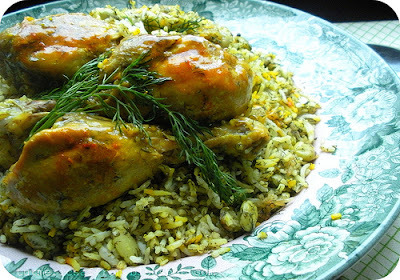 Such an intresting recipe.Is this dish only made during Nowruz or any other Persian holiday? Taste of Beirut, Thank you so much! My Persian Kitchen, It took a long time to make but wasn't too bad and I like the taste now! I'm so glad I made it. You should give it a try at least once, you might like it too. Eid Mobarak! 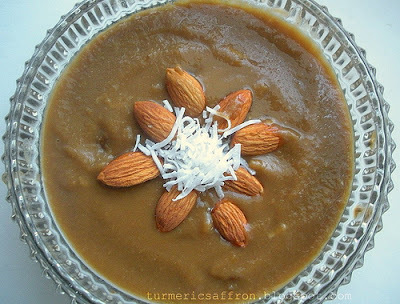 Cmiranda, This is a Nowruz (Persian New Year dish). Thank you so much for your lovely and inspiring blog. Do you think this would work in a food processor? 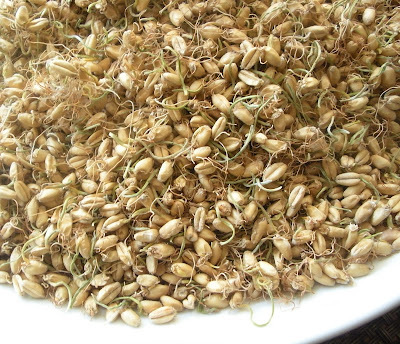 Can I dry the sprouted wheat and then add water to it before grinding it in the food processor? @Amy, You'll need to grind the seeds before adding water. Otherwise, it will become grainy. Thanks so much for visiting. Do you have instruction for how to make Sangak bread? Thank you for posting this recipe! Can you use store bought wheat germ instead? Anonymous, I wouldn't know, since I have never made samanoo with store bought wheat germ. If you happen to try it please let me know how it goes! Thanks. Could you please explain Step 2 more? Am I adding the water to the ground wheat germ or the whole wheat flour? In the end the pot has ground wheat germ, whole wheat flour, water, and the extra water squeezed out of the wheat germ, right? I'm so excited to have my first haft seen this year, and hope I can make good samanoo for it! Hi Amy Jan, I have added a more detailed explanations in the recipe and I hope you find them useful! Yes, that helped a lot! I was able to make the samanoo and surprise my Iranian friends. The color I got was not as dark as I have seen in store-bought samanoo, and some people said that it was a little grainy (maybe the fault of the kind of store bought flour I used), but everyone agreed that the taste was very good, and I am proud to have my first haftseen with homemade samanoo! I used a lot more water for taking the milk out of the sprouted wheat than in your recipe. I felt I should try to get all the color out of the sprouted wheat, so I added water and squeezed it out of the wheat and poured it in the pot about 10 times. Then I cooked it long enough for the water to be gone, about 5 hours total. Thanks again for your delicious blog, and especially for your help this year with samanoo! Amy jan, I'm so glad that you tried this recipe and that everyone liked it. Nowruz mobarak! Is sugar sometimes added to samanoo during the cooking process? Why are some samanoo's darker/richer in colour than others? Kourosh, no, there's no sugar added to samanoo during the cooking process. Samanoo is naturally sweet. The color of samanoo depends on the type of flour used and the length of cooking. for darker/richer samanoo, use unbleached whole wheat flour, lightly toast the flour in a pan and let samanoo cook/simmer on low heat for at least 3-4 hours. I first made samanu/samanoo for our sofreye haftsin about ten years ago. An acquaintance saw what I was doing and asked how I was going to use the homemade malt. It was a little difficult to explain. Later there was local media coverage about Now Ruz which helped educate and "normalize" the observance but initially I think some people thought we were interested in, well, you know, "really weird stuff". And speaking of weird stuff, got any recipes of abejo? I tried it but it never turned brown. Maybe next year. Or, I may just buy it already made next time.